Quang Ninh Buddhistical Managing Committee of Vietnam has made the greatest copper Pagoda on the mountain, measuring 1.35 m in height, 1.1 m bottom width, 1.4 m in length, 70 tons in weight and its area is 20 sq. meter. 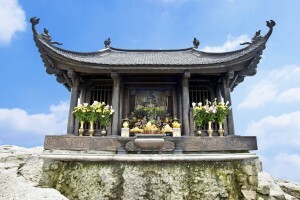 The pagoda was made using tiles and bells, between June 3, 2006 and January 30, 2007 and inaugurated at Mount Yen Tu, Quang Ninh Province, Vietnam. Comments for The greatest copper Pagoda on the mountain are now closed.